In case you haven't seen this book by John Bascom (published Jan, 2011) I would highly recommend it to all Freepers, but I warn you that it is the most evil book ever written. It is more scary than Stephen King's "IT" which, to this day, still causes goosebumples when I think of the clown-monster. 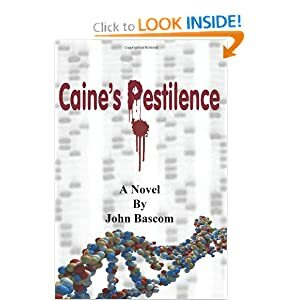 Bascom weaves a nasty tale, written as the autobiography of his central character. The plot is basically that through accidental means a terrible virus is unleashed on mankind. The fall out from that activity caused by Mr. Caine is described in horrid detail with many twists and turns that are just repugnant. America is in turmoil, even worse than today's real life. Gas is $10/gal, big brother and 'sis' are watching you every step of the way and no one can be trusted. I will not even try to offer up a glimpse of the terror and horrible events that are part of the plot, and I do mean PLOT!! FRiends, this book is very entertaining to the end but like most things contains just too many references to real life that are too chilling to contemplate. Get it and set aside an evening to read it. Make sure the doors and windows are locked and unplug the phone! And why would I read this now? Well, it DOES have a happy ending. That is something we could really use now...right? Added to my wish list, thank you. I don’t know who it was, but someone recommended “To Protect Against ALL Enemies Foreign and Domestic” Scary but not in the Steven King way,I can see the similarities to the present and I hope we see the same results. I downloaded it on my nook and read the entire thing the same night, if it was any of you, thanks. Hey back at ya...there aren’t any pictures in the book though...Hope you and the family are fine. So, (thread hijack) Perry?? yeah or nay? I trust you! Hey Geo. I’m with Perry for sure unless Sarah jumps in, then I don’t have friggin clue. I think you mean Travis McGee.